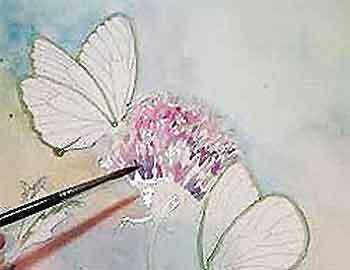 Follow me step-by-step and enjoy the confidence of painting butterflies. 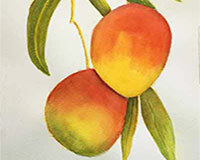 Watercolor paintings may be done on watercolor paper, watercolor canvas or Aquabord. Watercolor paintings done on cold-pressed paper are very nice. 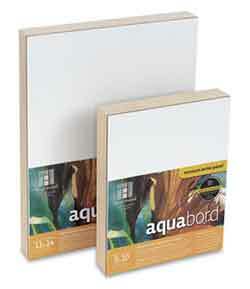 However I prefer to use Claybord or Aquabord. 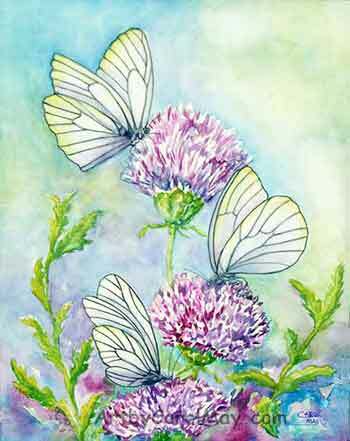 This butterfly painting is done on Aquabord made by Ampersand. Aquabord is great to paint on! 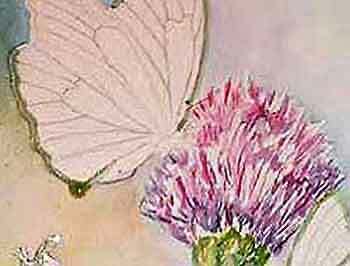 I used tube watercolor paints for painting butterflies. Mix your greens from the blue and yellow and use purple to darken the greens when necessary. Do a drawing on a separate paper. Then transfer it to the painting support with graphite paper. Erasures on the painting surface may damage it. 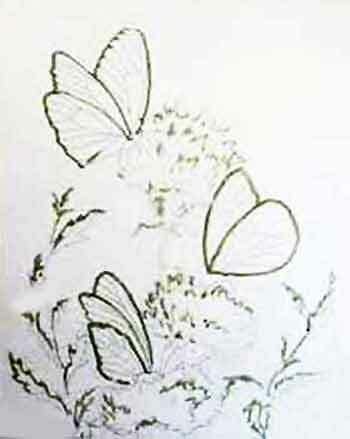 Place masking fluid around the butterflies to keep them white. Also put some masking on the flowers and leaves in places for highlights. Be ready to paint with Your supplies on hand. The light in this painting is coming from the top left. Lay in Thalo Blue with a soft wash brush. Make the upper left background darker. The upper background color gets lighter, as you go to the right side of the painting away from the light source. This is caused by reflected light. You may add a bit of yellow on the right side for the warmth of the reflected light. Lower in the painting, the colors get darker to help ground the painting. Use a smaller brush for the tighter areas. Add some violet in the background because the flowers are violet. It is good to repeat colors throughout the painting to give the painting cohesion. Add a bit of yellow in places, to co-ordinate with the leaves. Background colors get darker toward the bottom. 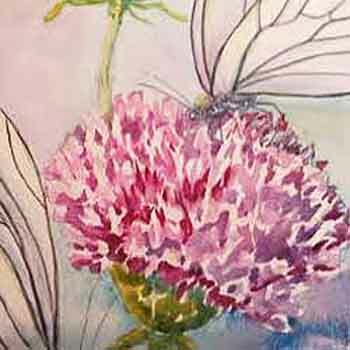 We paint the flowers before the butterflies because the butterfly bodies and legs go over the flowers. 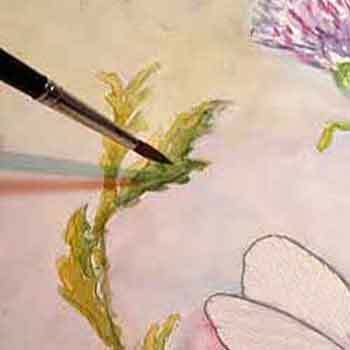 Use a small round brush to roughly lay in the flower colors. Use the warmer, reddish violet on the left side of the flower which is towards the light. Use the bluish violet on the bottom and the right side of the flower away from the light. Roughly fill in the color, don't try to paint individual petals. 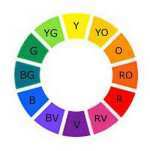 Vary the intensity of the colors by using more or less water. 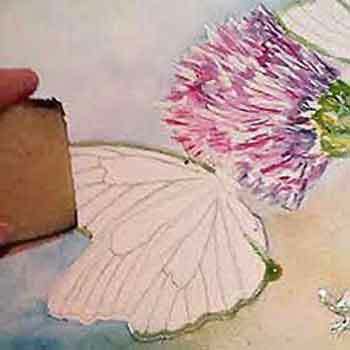 After the flower color is dry, remove the masking fluid from the flower. Now paint some individual petals with a small round brush. 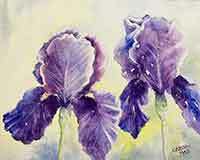 Use variations of light and dark violets and leave white spaces for sparkle. 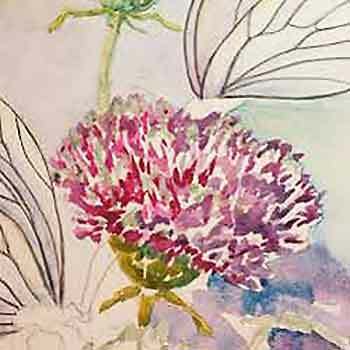 Extra petals are painted after the masking fluid is removed. Mix blue and yellow on your palette for your green to paint the calyx, sepals and stems. Mix the green lighter for the side toward the light (add more yellow). Mix the green darker for the side away from the light (add more blue). Notice the calyx color is darker on the bottom side which is shadowed. Paint the green flower parts. You may want to paint the leaves in more detail. I saved my detail for the butterflies and the flowers. Mix dark and light greens the way you did for the green parts of the flowers. Paint the leaves with a variety of light and dark greens. The leaves toward the light will have more yellow. Paint the shadow side of the leaves and stems a darker green, mixed with more blue. now we get to start painting butterflies! Remove the masking from the butterfly wings before we paint them. We want the butterfly colors to go out and softly touch the background colors. You may use a dry finger or a rubber cement pick-up tool to remove the masking. 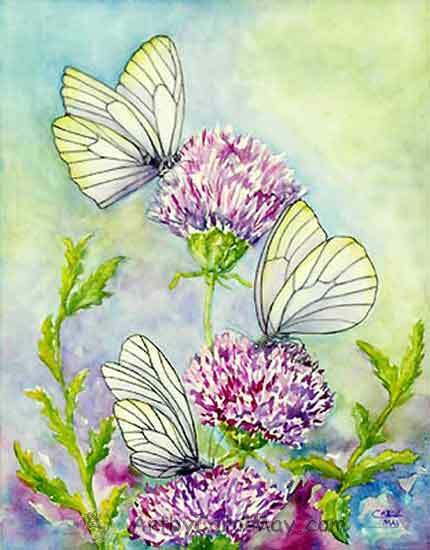 While painting butterflies keep in mind that butterflies actually have four wings. Mix lavender grey with yellow and red-violet. Paint the grey where the bottom wing overlaps the upper wing, on the lower part of the bottom wing and the fore-wing peeking out on the left. Put yellow on the top outer edges of the wings. The warm yellow brings it forward of the lavender grey wing behind it. Shade the butterfly's wings before painting the veins. 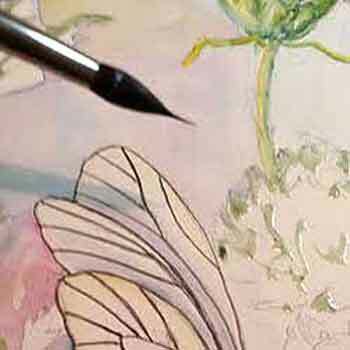 You may use any small, round brush or even a liner brush for painting butterfly veins. 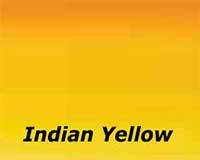 Mix a black by using the yellow, bluish violet and blue and paint the veins. If I make a wiggle-wobble or fat veins, I use a damp brush to pick up the extra paint before it dries. They have a head with two antenna, a thorax with six legs and four wings attached to the thorax and an abdomen. Use the same color you mixed for the veins. Make the body lighter toward the light source. 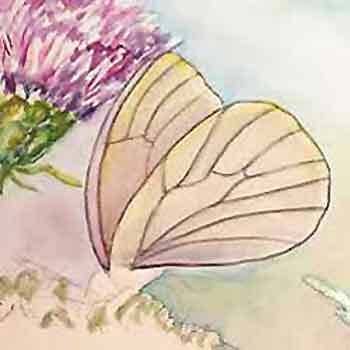 The butterfly's legs go out over the flower petals because the butterfly is standing on the flower. 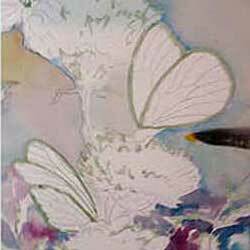 Now look around your butterfly painting and see what you might want to touch up. Values are what really make a painting sparkle! You may add more darks at this time, if you feel the painting needs it. Do it whatever suits your taste. You have an artist's license for painting butterflies. No two paintings will ever look the same. Every painting is an individual. Every individual artist will do their paintings in their own manner. 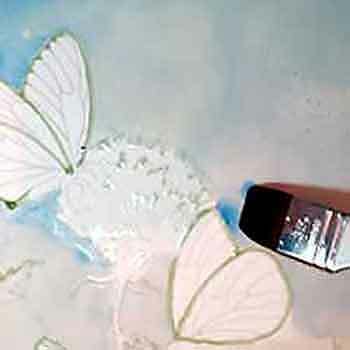 Painting butterflies is fun; you see how to do it. Now you can confidently paint your own butterflies. 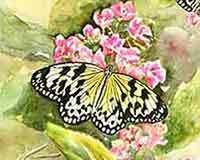 Paint a watercolor Longwing butterfly with me. What types of butterflies do we see in the United States?